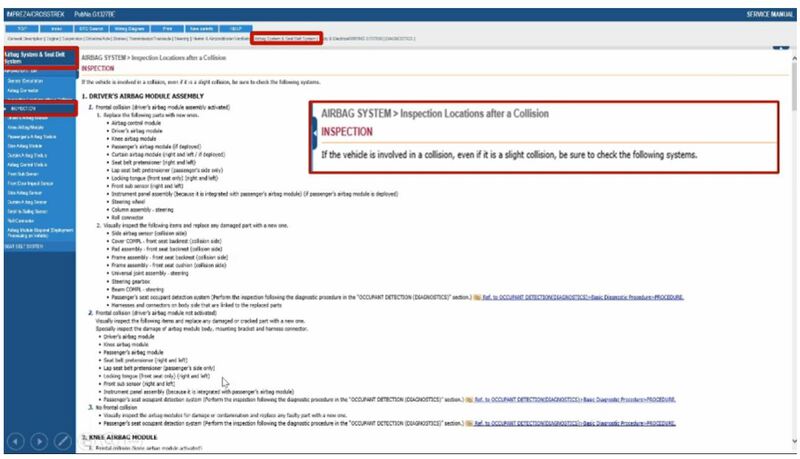 A Collision Advice webinar last month highlighted a lengthy list of inspections necessary on a Subaru Impreza or Crosstrek following a collision — “even if it is a slight collision,” as a service manual states. The webinar gave repairers a look at the various key category tabs on the service manual shared by what appeared to be both the 2018 Subaru Impreza and Crosstrek. These could include multiple part replacements, Anderson pointed out on the webinar, which was co-hosted by two Subaru collision representatives. According to the Crosstrek/Impreza directions displayed in the slide, any time a driver’s airbag module activates, a repairer must always replace the modules for airbag control, the driver’s airbag and the knee airbag. Other must-replaces include the steering wheel, roll connector, steering column assembly, right and left front sub sensors, right and left seat belt pretensioners, right and left locking tongues of the front seat and the passenger’s-side lap pretensioners. The right and left curtain airbag modules and passenger’s airbag module also must be replaced if deployed. If the passenger’s airbag module is deployed, the instrument panel assembly must also be swapped out. Even if the crash doesn’t activate a driver’s airbag module, a shop needs to visually inspect a variety of items and replace anything damaged on the Crosstrek/Impreza. An occupant detection procedure is also required. “I want to restate: I’m just the messenger here,” Anderson said. Even if the collision isn’t frontal, a repairer must still inspect airbag modules and check the passenger’s seat occupant detection system (a diagnostic procedure), according to the repair instructions. The webinar demonstrated that list of things Subaru wants inspected or even replaced after a “slight collision” involving the Crosstrek/Impreza goes on much longer, encompassing items like the passenger’s seat and roll connector, as the webinar demonstrated. “We need to make sure we do these things,” Anderson said. “We must accept personal responsibility,” he continued. And if a shop isn’t educated about such items, how can it blame an insurer, he argued. 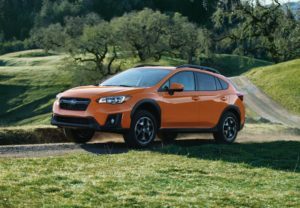 Subaru of America sold 144,384 Crosstreks (a record for the model) and 76,400 Imprezas last year.